So there was more than a little shifting and reshaping on the Kansas basketball recruiting trail over the weekend, and KU now enters a monster week with a new picture regarding two of its top targets in the 2019 class. KU coach Bill Self — along with Kentucky coach John Calipari — was expected to be in Minnesota on Sunday night for one final meeting with Top 10 prospect Matt Hurt before Hurt announces his decision on Friday, but multiple reports out of Minnesota on Sunday night indicated that Hurt and his family called those visits off and will have no more communication with the four finalists — Duke, Kansas, Kentucky and UNC — before announcing a decision on Friday. Division I men’s basketball recruiting is currently in a dead period and will be open again on Friday until a quiet period hits on April 25. Both Hurt and Top 40 shooting guard Cassius Stanley will have made their commitments by then, with Stanley now switching up his decision date to Saturday instead of Wednesday, which is the opening day of the spring signing period. While the Hurt news seems to be trending in the wrong direction for the Jayhawks — 65% of 247 Sports’ crystal ball predictions now belong to Duke compared to 30% for KU — there is at least some reason to believe that Kansas is still solidly in the running for Stanley, a 6-foot-5 freak athlete from North Hollywood, Calif., who had trimmed his final list to KU, UCLA and Oregon before adding Duke last week. Like with Hurt, many recruiting analysts believe that Stanley is headed to Duke, but the fact that he changed his announcement date after visiting Duke over the weekend to allow one final day of contact before an announcement means that KU still has a shot. Self and company could conceivably make one final trip west on Friday to try to sell Stanley and his family on Kansas one final time before the announcement is made. Until Duke got involved, many believed that the Jayhawks’ biggest obstacle to getting Stanley would be pulling him away from the west coast. But now that the Blue Devils are a factor, KU is facing two stiff challenges. 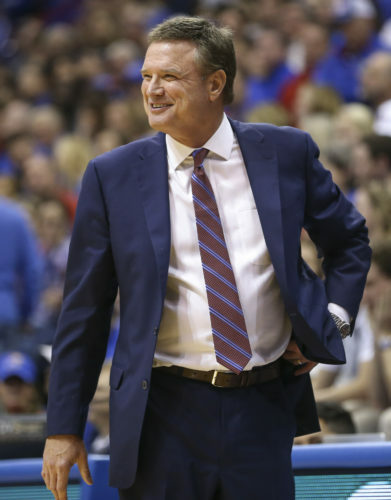 Throughout the past several weeks, as some of KU’s other top targets in the 2019 class have elected to commit and sign elsewhere, the promise and potential for landing Hurt and Stanley in the spring had given KU plenty of hope to put together a strong class to help replace what could be as many as five or six departures from the 2018-19 roster. 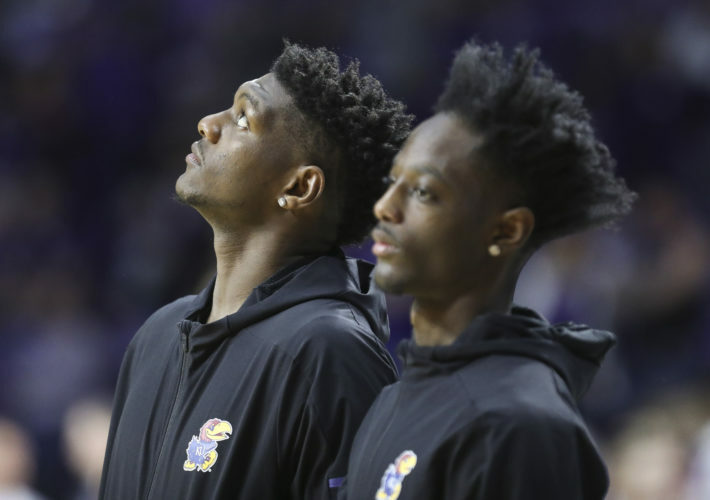 Now, with decision day looming for both players and the Jayhawks fighting to stay alive, Kansas may be facing the very real scenario of having to fill the class through other means in the coming weeks. While that might play out differently than many believed it would, it does not necessarily mean bad news for the Jayhawks. For starters, 2019 signees Christian Braun and Issac McBride are ready-made contributors who are already in the fold. Both are tough competitors and mature kids who will be ready to play meaningful minutes next season if needed. Beyond that, Self told the Journal-World recently that he would target grad transfers and potentially junior college talent as a way to fill the roster if needed and the market for both is as rich as ever, with scores of kids continuing to explore their transfer opportunities year after year. • Tristan Enaruna – 6-9 forward from Mount Pleasant, Utah, who Self and company have been recruiting for months. KUsports.com recruiting insider Matt Scott reported today that Enaruna will visit KU on April 28 after making similar trips to finalists Miami (Fla.) and Creighton in the days leading up to his visit to Lawrence. • Precious Achiuwa – 6-9 forward from Montverde (Fla.) Academy who is ranked No. 16 in the 2019 class by Rivals.com and is a 5-star prospect with tons of potential. Achiuwa, both at the McDonald’s All-American Game and last week’s Nike Hoops Summit, has been one of the hotter names on the spring all-star circuit and KU has been on him for a while. His decision is expected to come sometime in late May, with North Carolina and Memphis also very much alive in the chase. • Rayjon Tucker – This 6-5 wing and grad transfer from Arkansas-Little Rock averaged 20.3 points and 6.7 rebounds per game last year and has drawn early interest from KU, Memphis, North Carolina, West Virginia, Louisville and others. 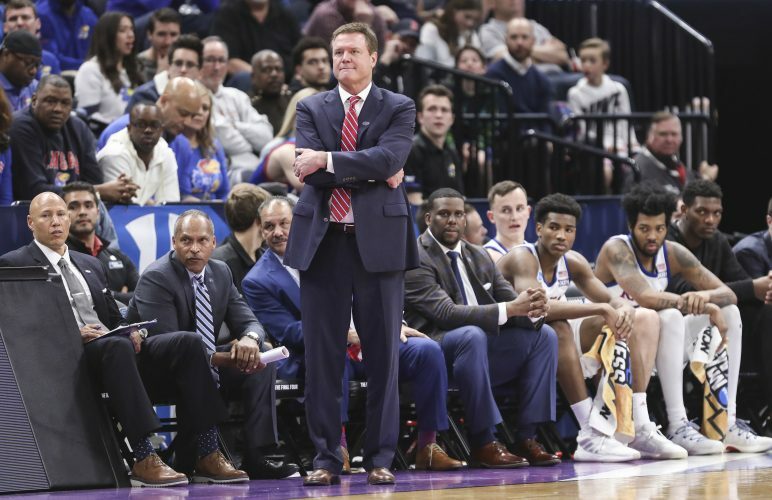 Originally from Charlotte, N.C., Tucker started his career at Florida Gulf Coast, where he played for former KU assistant Joe Dooley, before transferring to UALR for one season. He sat out the 2017-18 season in accordance with NCAA transfer rules and started all 30 games for Little Rock during the 2018-19 season. • T.J. Holyfield – 6-8 grad transfer from Stephen F. Austin, who missed last season because of a shoulder injury, indicated on Twitter recently that KU would be one of the visits he would take in the coming weeks, with Illinois, Texas Tech, Miami (Fla.) and Oregon also on the list. The big man with game down low and away from the rim averaged 13 points and 6 rebounds per game during the 2017-18 season while shooting 41 percent from 3-point range. • R.J. Hampton – 6-5 junior ranked No. 5 in the 2020 class who is considering reclassifying to the 2019 class. This would be the guy you sell out for. With or without Devon Dotson back on the floor, Hampton would give Kansas the star it needs in the 2019 class and would set things right in the recruiting world in a hurry. Many have called him the top prep guard in the country regardless of class and his ability to play fast, score all over the floor and use his size, vision and skill to produce his own numbers and set others up for theirs would be a monster addition to the KU roster. Clearly, there’s a lot of talent still out there even if the Jayhawks wind up missing out on Hurt and Stanley. These names are just a few of the players available with known ties to Kansas, but there’s no doubt that Self and company have a Plan B, Plan C and Plan D ready to roll should they need to utilize them in the coming weeks. With that in mind, here’s a quick look at the recruiting calendar for the next few months. Quiet Period: A time when prospects can talk to college coaches in person on a college campus. Coaches are not allowed to watch athletes compete in person, visit their school, talk to them at home or anywhere outside of the college campus. Dead Period: During the dead period, coaches may not have any in-person contact with recruits and/or their parents. Coaches are not allowed to talk to recruits at their college campus, the athlete’s school, a camp or anywhere else. Athletes and coaches are, however, still allowed to communicate via phone, email, and social media. Evaluation Period: A specific time of year when college coaches are allowed to watch an athlete compete in person or visit their school. However, coaches are not allowed to communicate with that athlete or his parents off the college campus. Coaches can sit in the stands during a recruit’s practice or game, as well as visit the recruit’s school to talk to coaches, teachers, counselors, etc. After the visit, the coach may call or email the recruit to let them know how their experience was. Contact Period: Any and all communication between athletes and coaches is fair game. Coaches can email, text, call or direct message recruits and their parents through any NCAA-approved methods and visits can take play on college campuses, at tournaments or at the recruit’s home or school.